Cardiac arrest – in layman’s words, a heart attack – is the end result of cardiac dysfunction. Heart problems is one of the most common diseases a person is at risk for, whether or not he or she is genetically predispositioned for it. Risk factors for heart problems are very common in the American population, with 49 percent of Americans with one out of three major symptoms for heart disease. When the heart cannot adequately pump blood to the rest of the body, that is called heart failure. It is a very dangerous problem that can lead to cardiac arrest if not managed properly. Half of people who are diagnosed with heart failure die within five years of the diagnosis. Cardiac arrest happens when the heart completely stops beating; CPR is needed by then. Out of the millions of people in the US, about 5.1 million have heart failure. One in nine deaths in 2009 was caused by heart failure. CPR stands for cardiopulmonary resuscitation. It is used during cardiac arrest, to oxygenate the blood (ventilation) and make the heart pump blood to the rest of the body (compression). It is an important skill for health care providers and the general public alike, being able to save lives if done timely and correctly. Chest compressions is the most important part of CPR. Unlike cardiac arrest in children, when adults get a heart attack, the poor oxygenation of organs is tissues is not due to decrease oxygen content in the blood (hypoxemia). Poor oxygenation of tissues (hypoxia) is caused by decreased circulation. Ventilations come second, which oxygenate the blood. During cardiac arrest, victims typically exhibit difficulty breathing manifested by gasping and similar behavior. Defibrillation is a slightly more advanced skill, and can only be done if an automated external defibrillator is available. Defibrillators are used to send electricity to the heart and in an attempt to bring back normal rhythm – sinus rhythm. They are not used during if the victim is experiencing asystole or “flatline”. 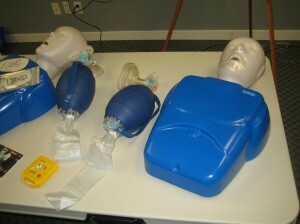 We offer five CPR training programs at Las Vegas CPR, as well as three re-certification classes. These classes are all give students certification once they are completed. Our programs are divided into two categories: basic and advanced. We have one basic course available to the public while the rest are for health care providers. Our basic courses teach students how to give the minimum level of care to a victim of cardiac arrest. This level of care is focused on stabilizing the victim through compressions and ventilation, before the arrival of medical help (EMTs). Students learn either one or two person rescue, depending on the course they take. Heartsaver CPR – A basic CPR course for the public, it teaches one-person rescue as well as basic first aid over a 4 hour session. Heartsaver CPR C – This program is the other version of the general public class, tailoring the lessons for HCPs while keeping the same curriculum. It runs for 4.5 hours. Basic Life Support for HCPs – This 4.5 hour program teaches one and two-person rescue, first aid, and the latest guidelines for CPR from the AHA.